On 27th November 1812 William Jenkin wrote to John Vivian telling him of plans and preparations for storing and shipping copper ore from St Michael's Mount. John Vivian was the Cornish copper agent for the Williams and Grenfell copper smelting concern of Swansea. William Jenkin was a 74 year old assayer and sampler of some 50 years experience who provided services to Vivian which clearly went beyond the specifics of sampling and assaying - shipping also came into his brief. William Jenkin was also great great grandfather of A.K. Hamilton Jenkin and a record keeper of huge dedication. A habit for which all Cornish mining historians should be eternally grateful, for it is from snippets in William's letter books and records that many of the wrinkles of the copper trade can be disentangled. William passed his business and his habit on to his son Alfred and their notes explain the workings of things that everyone at the time took for granted, such as the organisation of the copper sampling business and the fact that not all copper was sampled at the mine. We fixed on a spot the most convenient one we could get...It is now part of a boat builders’ yard, whose name is Mathews, and who readily consented to give up part of it... Its situation is convenient for the purpose wanted and may be divided into two or three compartments. Sir John St Aubyn's steward was with us, & the rent he fixed on is £7 a year from Xmas next. There is fully much work to be done before it will be ready to receive only and Leonard Millett is of opinion that a mason's wall ought to be built against the high bank of earth or rubbish on the south & south west part of the plot otherwise it will frequently fall down in considerable quantities on the ore – a wall must also be built on the north & east parts. But there are no stones allowed to be taken from any part of the Mount, & therefore I am apprehensive the separations must be made with timber & boards – either way they will be expensive. The Crown Co have adopted the latter, Daniell & Co the former, but they luckily had the stones which came from an old smith's shop. Until this plot can be got in order we have obtained a smaller spot as a temporary one, capable of holding 50 or 60 tons of ore (perhaps a little more). Ore plots on St Michael's Mount: black - John Vivian; Mauve - Sims; blue - Williams Foster; red - Pascoe Grenfell; yellow - Neath Copper Co. The harbour is shown in blue at the bottom left. While it is well known that the quays of the Fal and Hayle and Portreath were significant ports for the shipping of copper ore to Wales, the place of the Mount in this trade is less well known. It wasn't a major port but it had its advantages: the harbour is sheltered from the south westerlies by the Mount itself; it's on the route from the Fal to south Wales so is convenient for the collection of part cargoes; it was not the private property of any of the major smelters or other copper trade concerns; and it was a convenient alternative for the shipping of ores from the west of the county. It wasn't a big harbour but according to William Jenkin it could hold 50 sail. It certainly wasn't the most convenient shipping location, not least because of the limited access with mules having to take cargoes over the tidal sands, but Jenkin wasn't the only one to see potential there. A glance at the plan of the Mount in 1834 shows that ore plots were held by Vivian & Co., Sims, Williams Foster, Pascoe Grenfell and Neath Copper Co. These ore plots, or hutches as they are sometimes known, are simply for the storage of ore prior to shipping. The requirements, apart from proximity to a suitable quay, are relatively simple: a plot which can be flattened out and easily separated from surrounding plots with the possibility for internal sub-divisions should ore from more than one source be carried there. Jenkin was very particular about how his ore was shipped, as was his son Alfred, and they went to some lengths to keep different types of ore separate. For instance, on June 18th 1835 Alfred wrote that the object in purchasing the low-sulphur ores of Wheal Edward and Levant the previous week had been to keep them separate from other inferior ores and then mix them with the other ores at the smelter to produce a cheaper smelt. If the half parcel of Levant & the Wheal Spearne Moor ores be shipped in one cargo, I wish them to be noted as such on the bill of lading, but if some of the Retallack & Hallamaning ores be put into the same vessel in order to make out the cargo with the former ores, to be kept separate from the latter & the separation mentioned in the bill of lading…Levant & Spearne Moor ores on the bottom .. be pleased to mark all ores shipped from the Mount as No 2 on the bill of lading…. Although not shipping large quantities from the Mount Alfred was keen to retain the option, especially as there were growing problems with sand accumulation at Hayle. In April 1834 he wrote to Teague to discuss acquiring more space on the Mount; the idea seems to have been to take on the adjacent hutch shown on the plan as belonging to Neath Copper Co. but it is unclear whether or not this happened. The Levant and Spearne Moor ores discussed on 14th December had been sold at the Redruth Ticketing of 12th December. 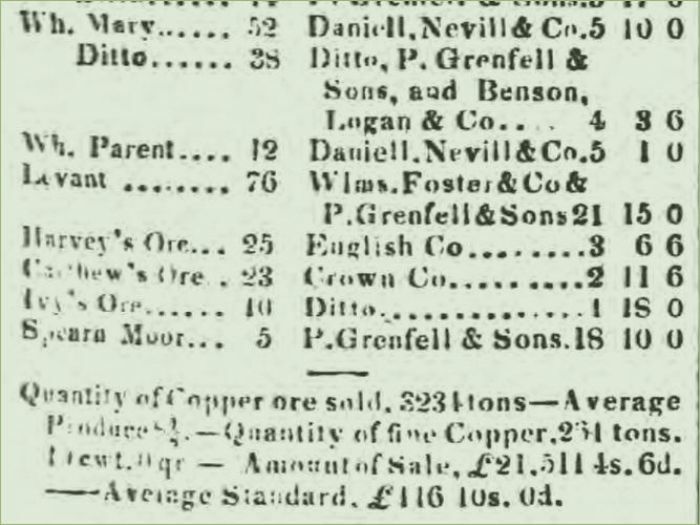 The 5t of Spearne Moor ores had been purchased at £18-10-00 and 76t of Levant ores was split between Pascoe Grenfell and William Foster at £21-15-00. All other ores purchased by Pascoe Grenfell at that ticketing fell in the price range £3-11-00 to £8-4-00. So valuable were these ores from St Just that Alfred Jenkin suggested that the company may wish to insure them, given the likelihood of storms at this time of year. Unusually, we know the name of the vessel these ores were shipped on. Alfred notes in his letter to the company on 25th January that they will be shipped on the Emulous, a new ship carrying her first cargo. Emulous departed Penzance in the week ending 1st February 1834, she was bound for Cardiff under Captain George. No record has been found of her arrival in Cardiff but in the week ending 15th February 1834 Emulous departed Swansea bound for Neath and in the week ending 22nd February she is recorded as departing Cardiff for St Ives. Evidently she had cargo for Cardiff before taking the Levant and Spearne copper ore to Swansea. The Jenkin Letterbooks are in the care of the Courtney Library at the Royal Cornwall Museum. A biography of William Jenkin can be found in A.K. Hamilton Jenkin, News from Cornwall with a Memoir of William Jenkin, Westaway, 1951. A very readable three part study of the Jenkin copper agency has been written by Penny Watts-Russell and can be found in the Journal of the Trevithick Society no 37-2010, no 39-2012 and no 40-2013. Shipping movements for vessels in and out of Cornish ports in this period can be found in the Royal Cornwall Gazette and the movements for south Wales in the same period can be found in the Glamorgan Monmouth and Brecon Gazette and Merthyr Guardian or The Cambrian. Welsh newspapers can be searched free-of-charge on the website of the National Library of Wales. The Royal Cornwall Gazette is available via the British Newspaper Archive (subscription required) or via the Online Reference Service of Cornwall Libraries, which is free to library card holders.